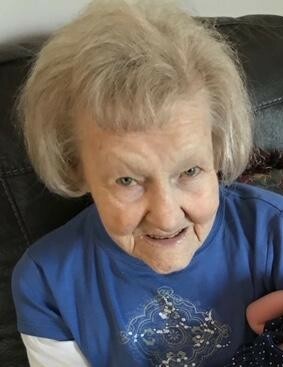 Mary “Thelma” Carroll, 88, of Crestwood, KY, passed away peacefully on March 31, 2019, surrounded by loved ones. Thelma was born November 15, 1930, in Louisville, KY.
She was preceded in death by her parents, William and Catherine Younger; her three siblings, James Younger, Charles Younger and Marie Wallace; her son William “Larry” Stich, and son in law, Shawn McMaster. Thelma is survived by her six children, Dennis Stich (Debbie), David Stich, Diane McMaster, Kelley McDaniel (Mark), Kim Steinbock (Bill) and Chuck Carroll (Robin); as well as two stepchildren, Derald Carroll (Karen) and Jeff Carroll, Sr. She was known as “Nan” and “Grandma” to 26 grandchildren, 33 great-grandchildren and 5 great-great-grandchildren. Thelma was a member of St. Aloysius Church. She loved being surrounded by family and children, as well as attending bingo with her dear friends, especially Ann Clements. Visitation will be held Tuesday, April 2, 2019 from 4 to 8 p.m. at Stoess Funeral Home in Crestwood, KY. Funeral services will be celebrated on April 3, 2019, at 10am at Calvary Cemetery Chapel led by Fr. John Stoltz of St. Aloysius Catholic Church of Pewee Valley, with burial at Calvary Cemetery. Expressions of sympathy may be made in her honor to Mass of the Air or Hosparus Health of Louisville.